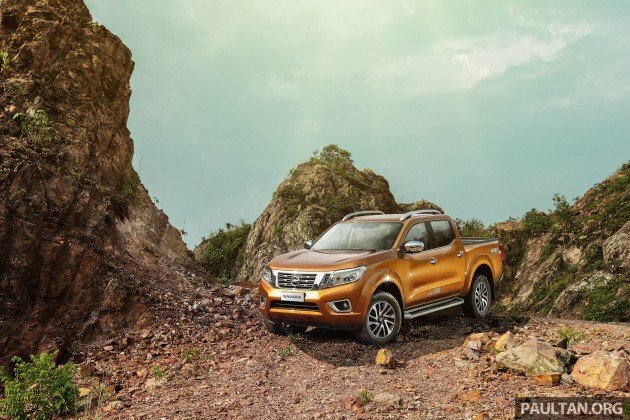 We’ve covered the Nissan NP300 Navara from the very start – we were at hand during the global unveiling in Bangkok last year, then drove it in Chiang Mai shortly after. Spyshots, a local preview and an appearance on the Driven Web Series later, the new Mother Trucker has finally been officially launched in Malaysia! Firstly, the prices. Fully-imported (CBU) from Thailand, the NP300 is available in six variants locally – the manual single cab model is priced at RM79,000, while the base double cab E manual retails at RM89,800. Moving up the range, there’s the SE that costs RM97,800 for the manual and RM102,800 for the automatic model, followed by the automatic-only V priced at RM109,800. The VL with all the bells and whistles tops the range with a retail sticker of RM120,800. All prices are on-the-road without insurance, inclusive of a three-year/100,000 km warranty. The new Navara is a handsome-looking thing – the muscled-up design is more aerodynamic than before (0.37 Cd vs 0.43 Cd) and hides the slightly longer, if lower dimensions. It measures 5,255 mm long, 1,850 mm wide and 1,785 mm tall, with a wheelbase of 3,150 mm. The single cab model gets a longer bed with a built-in side step; the latter is said to be first-in-class and is rated up to 250 kg. Inside, the pick-up carries an interior design that’s reminiscent of Nissan’s passenger cars, albeit trimmed in hard plastics. Still, all models get nifty touches such as a dash-top tray with its own 12 V power socket, along with a cup holder under the driver’s side air-con vent to keep beverages cool. Double cab models also get the fantastic zero gravity-inspired seats cribbed from the Teana, as well as rear air-con vents. The single cab model is as basic as it gets, coming with halogen reflector headlights, fog lights, 16-inch steel wheels and black wing mirrors and door handles. Step inside and you’ll find just a double-DIN radio/CD/MP3 head unit with AUX-in, four speakers and vinyl upholstery as creature comforts. The double cab E doesn’t fare much better, but at least it gains a rear spoiler, side steps, fabric seats, a USB port and six speakers. Stepping up to the SE adds 16-inch alloy wheels, chrome grille and door handles and chrome power-folding wing mirrors with LED indicators. The V model receives i-Key keyless entry, push-button ignition, cruise control, a 5.0 inch central display, Bluetooth, multifunction steering wheel controls and a reverse camera. The manual air-con controls also go from plain dials to a push button array with fan and temperature knobs. From there, the posh VL variant piles on LED projector headlights with LED daytime running lights, snazzy 18-inch dual-tone alloys, roof rails, an eight-way power-adjustable driver’s seat, leather upholstery, dual-zone automatic climate control and an auto-dimming rear-view mirror with a digital compass display. 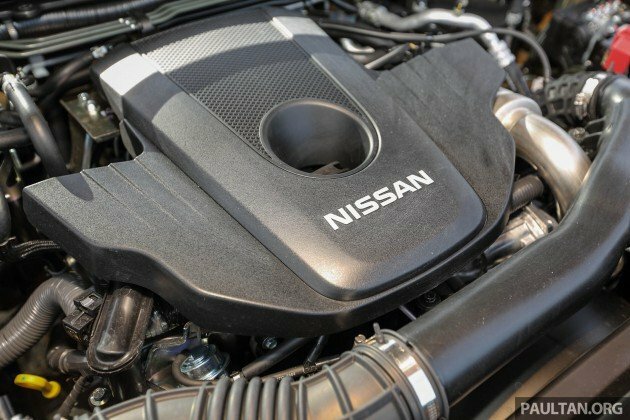 No matter which model you get, under the bonnet resides a revised version of the current Navara’s 2.5 litre YD25DDTi four-cylinder turbodiesel engine. However, only the mill in the top VL trim produces the full 190 PS at 3,600 rpm and 450 Nm at 2,000 rpm; the other variants make do with 163 PS and 403 Nm. Single cab and double cab E models come standard with a six-speed manual gearbox, while V and VL variants are offered solely with a seven-speed automatic with manual override; the SE gets a choice of both. All models come with all-wheel drive, switchable on-the-fly at speeds of up to 100 km/h. Double cab models are fitted with multi-link rear suspension with coil springs, while the single cab soldiers on with leaf springs. 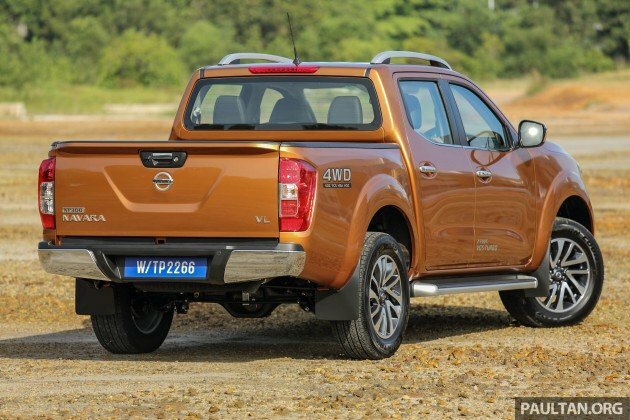 Last but not least, safety – the NP300 Navara comes with dual airbags as standard but, sadly, not ABS. You’d have to punt for the SE to receive it, but at least you’d also get EBD, brake assist, Vehicle Dynamic Control (VDC), traction control, brake-based Active Brake Limited Slip (ABLS), Hill Start Assist (HSA) and Hill Descent Control (HDC). The colour palette on double cab models consist of Savanna Orange, Tungsten Silver, Diamond Black and Brilliant White; the last colour is the only option for the single cab model. 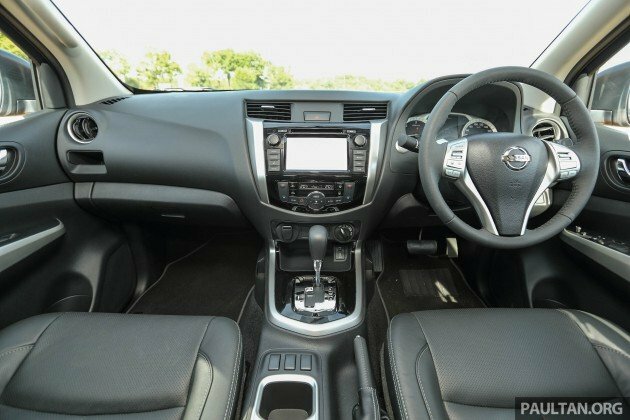 Options include a TCAT Multimedia Navigation system with a 7.0-inch touchscreen (RM3,922), combination leather seats (RM2,438) and an Elegance Package (RM1,166) consisting of sport pedals, stainless steel kick plates, door visors and chrome door handle finishers. Elsewhere, a Pro-Form Tango cargo bed cover (RM5,830) and sports bar (RM2,650) are offered as well; the whole set is yours for RM7,950. Four types of window tint are also available – Solar Gard (S/C) at RM1,272, Solar Gard at RM1,484, Solar Gard Armorcoat at RM2,067 and V-Kool Elite Security at RM5,141. Want to find out if you should put your money down for the new Nissan NP300 Navara? Read our review here, or watch the latest Driven Web Series episode to see it slug it out with the facelifted Ford Ranger 3.2 Wildtrak and Mitsubishi Triton VGT Adventure for class honours. Stim betul aku tengok awek. Hari ni Malam Jumaat. Tak tahan aku. Got Stability control ? 7airbags ? Old hilux failed the Moose test, it tend to roll over. No 6 (or 7?) airbags + Single cab & E No ABS? 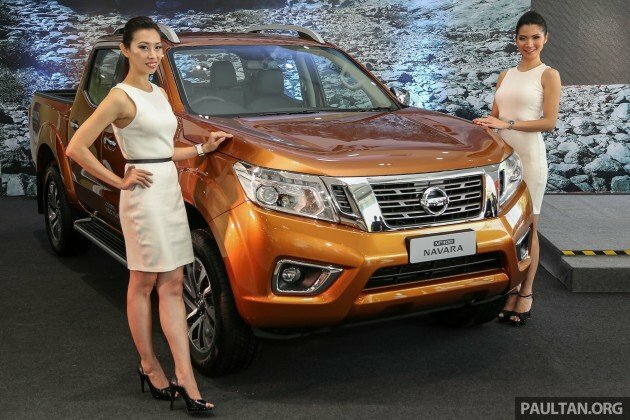 Seems like the new Navara’s body has be lowered a bit, or are the models very tall? You’re prone to optical illusion ? Models are quite tall. Model on the right (www.mrsjuneyap.com) is 184cm in heels. Moved into 21st century, then falling back to 1999. I was aiming for the top-spec VL to replace my sedan. But the prices….hmmm. I think I rather wait till next puasa month and get it with a bigger Raya discount plus optional equipment thrown in for free. At these prices for the top-spec, I don’t think the target market would be running to the showroom to make bookings like the new X-Trail. what ? no ABS ? not even on the top spec VL ? There is ABS on the SE models onward. ohhhh. thanks for the info. There is no NissanConnect infotainment??? Can anyone clarify? Nissan 2.5…eventho its upgraded n refined, still considered decent. Will not pecah market unless 2.3 twin vgt is here. If the price is the issue than solve it out. Assemble other accesories thats made in malaysia, import these engine. If still lot red tape, better not. The body n suspension is nice.. i would just look it from outside. Thank u..